Last seen at 4:30pm October 10th, 2007, on a seat near the front of the 558 express bus. This week the weather went from being 85 degrees on Sunday to being 55 degrees on Monday. It's finally fall here. Fall has the potential to be one of the best seasons in Minnesota, when it's sunny and the leaves are turning and the sky is full of fluffy clouds and it's 60 degrees outside I think it's perfect. But I think we've skipped that lovely portion of fall and went directly to the cold, cloudy, windy, rainy portion of fall. Bleh. At least the dreary portion of fall gives me a reason to wear all the hats and scarves and mittens I own. And I own a lot of them. Most of them are unmatching or mismatched at best, I never buy or knit a matchy-matchy hat-scarf-glove set. So I've been thinking this fall about what sorts of hats, mittens and scarves I could knit to combine (and match!) with stuff I already own. I've been contemplating the Center Square hat, the Chapeau Marnier hat and the Foliage hat from Knitty and some colorwork mittens like the Anemoi pattern from Eunny Jang. Then yesterday I lost a hat. One of only two hand-knit hats that I made for myself. A hat that matched my fetching mitts. My Odessa hat! I left it on the bus on my way home from work last night. I called the lost and found and (not surprisingly) it has not been turned in. I hope it's found a good home. Now my plans for new hat patterns (and mittens) have been put on hold. I really, really miss my Odessa hat. I put hours and hours of work into that hat. It's the only hat I own that matches my fetching mitts, and without it I will probably never wear them. So I need to knit another hat with the same yarn. 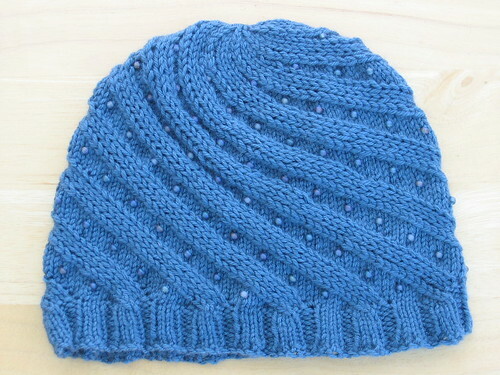 I have two choices I guess: knit another Odessa hat or knit a new hat pattern in the same color yarn. I don't know which I'll opt for. I'll decide after I'm done mourning the loss of my hat. Oh NO! Not the Odessa hat! !